Preheat oven to 425°F. Cover a baking pan with foil and coat with nonstick cooking spray. 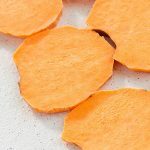 Peel and thinly slice the sweet potatoes (about quarter inch rounds). In a bowl, toss the rounds with olive oil, chili powder, garlic powder, and paprika. Spread rounds evenly on prepared pan. Bake for 10 minutes and use a spatula to flip. Bake for another 5-10 minutes or until crisp. Sprinkle beans and cheese over the sweet potatoes. Return to oven until cheese melts, about 2 minutes. Sprinkle with tomato and avocado. Serve.